Continuing his Lok Sabha election 2019 campaign, clubbing project inaugurations and rallies, Prime Minister Narendra Modi visited his own constituency Varanasi on Tuesday. Addressing a gathering after laying the foundation stone of Ravidas Janmasthali area development project in Varanasi, Modi invoked Sant Ravidas, a mystic poet of the Bhakti Movement, on his birth anniversary to urge people to end caste discrimination and identify those who promote it for "self interest". Modi said caste discrimination is an impediment in achieving social harmony. "Guruji (Sant Ravidas) had said that there should be no discrimination on the basis of caste. Till caste discrimination is there, people cannot connect with each other, social harmony is not possible and equality cannot be ensured," the prime minister said. "Identify those who for their self-interest, create caste discrimination and promote it," he asked people, without taking any names. "My government focussed on panchdharma: education, income, medicine, irrigation and addressing public grievances," he said, "irrespective of caste, creed and other factors." "Unfortunately, caste discrimination could not be removed till now. The New India will witness this change with help of youth," he said, referring to his vision of the country in the 21st Century. 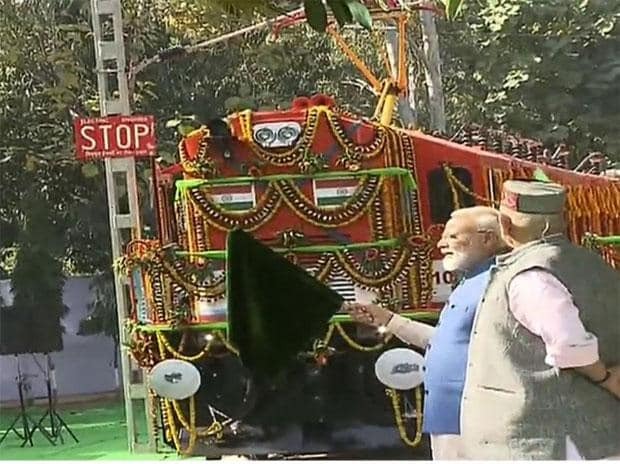 At the Diesel Locomotives Works in Varanasi, Modi also flagged off the first electric locomotive converted from a diesel engine in the country. He also inspected it from inside. Catch LIVE updates on Modi's Varanasi visit and campaigns for the Lok Sabha elections 2019.